Perfection! I love the way he's looking over his shoulder. Got to agree with Birdlady, the perfect bird capture. Another perfect shot and he's a cutie! 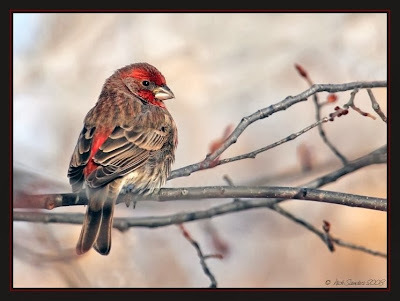 Your housefinches have a lot more red than mine! Beautiful! A common bird - yet you captured an uncommonly beautiful image!